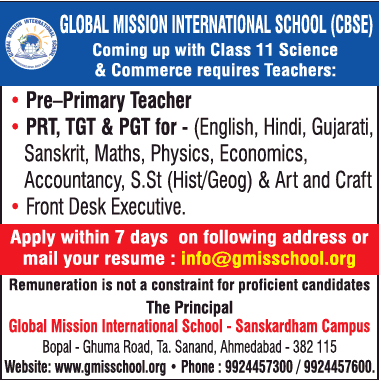 Global Mission International School, Ahmedabad Recruitment 2019 Teachers PGT / TGT / PRT / PPRT Jobs Notification,Jobs in Global Mission International School Notification 2019 For Teachers PGT / TGT / PRT / PPRT,Teachers PGT / TGT / PRT / PPRT Jobs in Global Mission International School. can apply within 7 days from the notification date. Interested Candidates can send the Updated Resume to College address or Mail Address for Global Mission International School Teachers PGT / TGT / PRT / PPRT Vacancies. 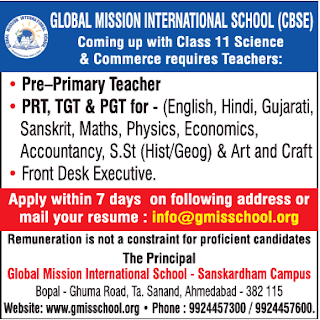 Eligible Further Details to see the Official website https://www.gmisschool.org/.Requried Details like Salary, Important dates, Selection Process,Email-id, College Address, Qualification are given below. Starting Date to apply: 25-03-2019. Ending Date to apply: within 7 days from the notification date. Eligible applicants Interested Candidates can send the Updated Resume to College address or Mail Address are given below. Last date to apply within 7 days from the notification date.